Highlights From The Betsy DeVos Hearing: School Vouchers, Oligarchy And Grizzlies : NPR Ed Donald Trump's pick to lead the Education Department got a grilling on a range of issues, from private school vouchers and charter school oversight to guns in schools. How did she fare? Betsy DeVos prepares to testify at her confirmation hearing. We've reported extensively on DeVos' background, her advocacy in Michigan and on the research behind school choice. "President-elect Trump and I know it won't be Washington, D.C., that unlocks our nation's potential, nor a bigger bureaucracy, tougher mandates or a federal agency. The answer is local control and listening to parents, students, and teachers." This came from DeVos' opening remarks, and succinctly captures her education philosophy: Limit the role of government in America's schools and trust that the free market — and parent choice — will lead to innovation and improvement. Murray: "Can you commit to us tonight that you will not work to privatize public schools or cut a single penny from public education?" DeVos: "Senator, thanks for that question. I look forward, if confirmed, to working with you to talk about how we address the needs of all parents and all students. And we acknowledge today that not all schools are working for the students that are assigned to them. And I'm hopeful that we can work together to find common ground and ways that we can solve those issues and empower parents to make choices on behalf of their children that are right for them." Murray: "I take that as not being willing to commit to not privatizing public schools or cutting money from education." DeVos: "I guess I wouldn't characterize it in that way." Murray: "Well," she said, laughing, "OK."
The committee's chairman, Lamar Alexander, a Tennessee Republican and former education secretary himself, asked DeVos whether she would try to push school vouchers onto states even though the federal education law, the Every Student Succeeds Act, does not include or allow it. "No," she answered. "I would hope I could convince you all of the merit of that in maybe some future legislation, but certainly not any kind of mandate from within the department." Former senator — and former Democrat — Joe Lieberman introduced DeVos at the hearing. He has worked with her as a board member of her school choice advocacy group, The American Federation for Children. DeVos has never taught in, managed or attended a public school. 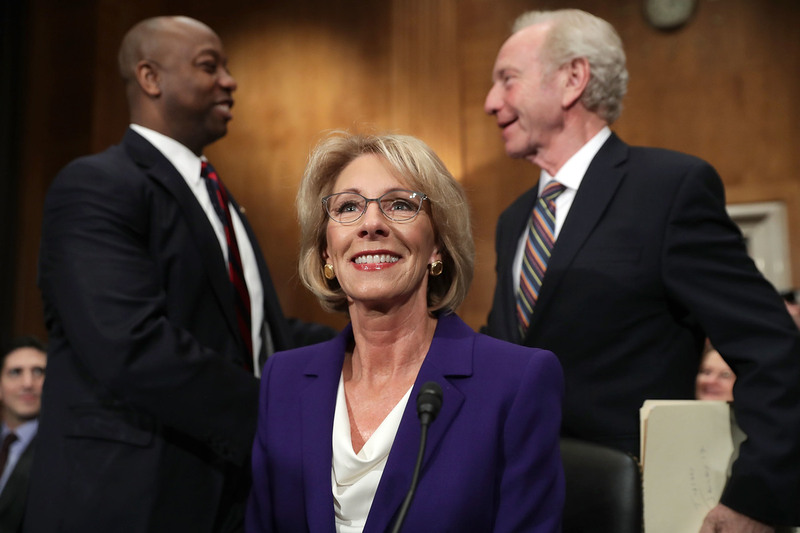 "I know that some people are questioning her qualifications to be secretary of education," Lieberman said. "And too many of those questions, to me, seem to be based on the fact that she doesn't come from within the education establishment. But honestly I believe that today that's one of the most important qualifications you could have for this job." "Do you think that guns have any place in or around schools?" DeVos: "I think that's best left to locales and states to decide. If the underlying question is..."
Murphy: "You can't say definitively today that guns shouldn't be in school?" DeVos: "Well, I will refer back to Senator Enzi [that's Mike Enzi, R-Wyo.] and the school that he was talking about in Wapiti, Wyoming. I think probably there, I would imagine that there is probably a gun in the school to protect from potential grizzlies." It's important to note that Murphy represents Connecticut where, in 2012, a gunman shot and killed 20 children and six staff members at Sandy Hook Elementary School. Warren: "Do you support protecting federal taxpayer dollars from waste, fraud and abuse?" Warren: "Oh good, so do I. Because now we all know that President-elect Trump's experience with higher education was to create a fake university which resulted in his paying $25 million dollars to students that he cheated. So, I'm curious about how the Trump administration would protect against waste, fraud and abuse at similar for-profit colleges. So here's my question, How do you plan to protect taxpayer dollars from waste, fraud and abuse by colleges that take in millions of dollars in federal student aid?" DeVos: "Senator, if confirmed, I will certainly be very vigilant..."
Warren: "I'm asking how. You said you were committed. I'm asking how you are going to do that." DeVos: "The individuals with whom I work in the department will ensure that federal monies are used properly and appropriately, and I will look forward to working with you." Warren: "So you're going to subcontract in making sure that what happened with universities that cheat students doesn't happen anymore?" DeVos: "No, I didn't say..."
Warren: "You're going to give that to someone else to do? I just want to know what your ideas are for making sure we don't have problems with waste, fraud and abuse." DeVos: "I want to make sure we don't have problems with that as well. And if confirmed, I will work diligently to ensure that we are addressing any of those issues." Warren: "Well, let me make a suggestion on this. It actually turns out that there's a whole group of rules that are already written and are there and all you have to do is enforce them. So what I want to know is, will you commit to enforcing these rules to ensure that no career college receives federal funds unless they can prove that they are actually preparing their students for gainful employment and not cheating them?" DeVos: "Senator, I will commit to ensuring that institutions which receive federal funds are actually serving their students well." Warren: "And so you will enforce the gainful employment rule to ensure that these career colleges are not cheating students?" DeVos: "We will certainly review that rule." Warren: "You'll review it? You won't commit to enforce it?" DeVos: "And see that it is actually achieving what the intentions are." Kaine: "Do you think K-12 schools that receive federal funding should meet the same accountability standards, outcome standards?" DeVos: "All schools that receive public funding should be accountable, yes." Kaine: "Should meet the same accountability standards?" DeVos: "Yes. Although, you have different accountability standards between traditional public schools and charter schools." Kaine: "But I'm really interested in this, should everybody be on a level playing field? So public, charter or private K-12 schools, if they receive taxpayer funding, they should meet the same accountability standards?" DeVos: "Yes, they should be very transparent with the information. And parents should have that information first and foremost." Kaine: "And, if confirmed, will you insist upon that equal accountability in any K-12 school or educational program that receives federal funding whether public, public charter or private?" Kaine: "Equal accountability for all schools that receive federal funding." Kaine: "Okay, is that a yes or a no?" DeVos: "That's a, 'I support accountability.' "
Kaine: "Do you not want to answer my question?" If DeVos had a true stumble last night, it came shortly after the exchange above, when Kaine pivoted to the Individuals With Disabilities Education Act. The federal law requires schools to provide students with disabilities the same educational opportunities that they provide students without disabilities. Given the limited resources in many districts, the requirements of IDEA have often strained school budgets, and the law is now at the center of a U.S. Supreme Court case over just how far schools must go to meet the needs of their students with disabilities. DeVos, at least initially, appeared not to understand IDEA or how it works. Kaine: "Should all K-12 schools that receive taxpayer funding be required to meet the requirements of the Individuals With Disabilities Education Act?" DeVos: "I think that is a matter that's best left to the states." Kaine: "So some states might be good to kids with disabilities, and other states might not be so good. And then, what? People can just move around the country if they don't like how their kids are being treated?" DeVos: "I think that's an issue that's best left to the states." Kaine: "What about the federal requirement? It's a federal law — the Individuals With Disabilities Education Act. Let's limit it to federal funding. If schools receive federal funding should they be required to follow federal law — whether they're public, public charter, or private?" At this point, DeVos attempted to invoke a Florida program that came up earlier in the back-and-forth, but Kaine insisted on a yes or no answer. Ultimately, DeVos answered: "I think that is certainly worth discussion." Sen. Bernie Sanders, I-Vt., wanted to know about DeVos' personal fortune. Sanders: "Mrs. DeVos, there is a growing fear I think in this country that we are moving toward what some would call an oligarchic form of society. Where a small number of very, very wealthy billionaires control, to a significant degree, our economic and political life. Would you be so kind as to tell us how much money your family has contributed to the Republican party over the years?" DeVos: "Senator, first of all, thank you for that question. I, again, was pleased to meet you in your office last week. I wish I could give you that number. I don't know." Sanders: "I have heard the number was 200 million. Does that sound in the ballpark?" DeVos: "Collectively? Between my entire family?" Sanders: "Yeah, over the years. Yes." Sanders: "My question is, and I don't mean to be rude, but do you think, if you were not a multi-billionaire, if your family had not made hundreds of millions of dollars of contributions to the Republican party, that you would be sitting here today?" DeVos: "Senator, as a matter of fact, I do think that there would be that possibility. I've worked very hard on behalf of parents and children for the last almost 30 years to be a voice for parents, voice for students, and to empower parents to make decisions on behalf of their children, primarily low-income children."